Multiple of 12 sts, + 8. All even rows are purl to end. Stitch repeat is highlighted in pale yellow. - K: Knit on RS and purl on WS. - SSK: Slip slip knit. - K2tog: Knit 2 stitches together. - K3tog: Knit 2 stitches together. 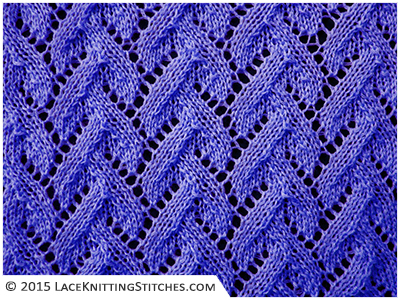 - Sk2p: Slip stitch as if to knit, knit 2 stitches together, pass slipped stitch over.